While on the subject of Gallo Speakers, here’s about as far as you can get from the baby-sized A’Diva satellites: speakers that tower 78″ tall, pack some 12 4″ aluminum woofers each, and deliver nearly omni-directional sound. Micro speakers (5″ each), yes, but in a slender but tall enclosure. The Reference 5LS speakers, due third quarter 2007 but shown recently at CES in prototype form, alternate mid-range spheres with tweeter cylinders vertically. The idea is to deal with phase and dispersion issues in a nearly (though not quite) omni-directional speaker. Gallo also showed off a reference amp that would couple with the speakers (the Reference SA). Scheduled to be released to the public in the third quarter of 2007, the towering speaker stands 78” tall, boasts an incredible 12 custom aluminum 4” woofers and features seven of AGA’s proprietary CDT II tweeters, which possess power-handling, off-axis response and efficiency that approach the textbook definition of ideal. In addition, the Reference 5LS has eight 4″ carbon fiber midrange drivers, each housed it its own 5″ spherical enclosure. 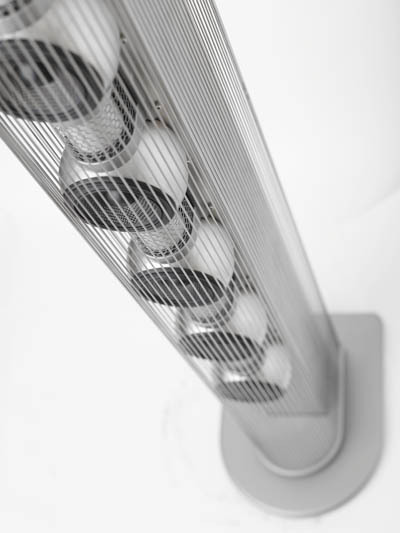 Many line sources horizontally offset their various drivers, but AGA alternates tweeter cylinders with mid-range spheres – one atop the other – in perfect vertical alignment. Because of this, the phase and dispersion problems caused by driver offset are entirely eliminated. Capable of being driven by a single, capable amplifier, the 5LS offers the options of bi- or tri-wiring, as well as bi- or tri-amping. Although capable of handling massive power, the crossover-less design and high efficiency of both the CDT II tweeters and carbon-fiber midrange drivers are perfect matches for low-powered, high-performance amplifiers. The first-order low-pass filter used for the bass drivers (The only crossover employed in the 5LS) can be bypassed, enabling the LF enclosure to be driven from the LFE output of a processor, or from a separate amplifier. At 7” wide by 11” deep, the Reference 5LS sports quite a slender profile. The twelve 4” woofers fire out the back and equal the cone surface of a 15” subwoofer, while offering speed and transparency that a large single driver cannot match. In addition, the Reference 5LS features AGA’s patented S2 Technology, as well as their trademark spherical enclosure, which eliminates any external diffraction. For even more groundbreaking performance, the company’s optional Reference SA amplifier, which features volume, phase and crossover adjustments, is ideal for this application. The Reference SA allows the speaker to be placed for optimal imaging and soundstaging performance, and then fine-tuned for bass using the SA’s control facilities.